Meet the swimming supremos of Katiet! This little group of mostly girls and some boys aged from 6 to 12 just love the water. After English class has finished it’s time for swim class. Three times a week, weather and ocean conditions permitting, KSC hits the water, donning goggles and grabbing swim floats, eager to practice and improve. Although most of the group can swim about 5 metres, as soon as they need to breathe their legs go down and they stand up. Hence, prior to starting swim class they would never swim out of their depth, fearful of the deeper water and being far from the shoreline. This is particularly true of the girls who have no local female role model to encourage them or act as a example. These girls are breaking boundaries. The courage and fearlessness they display are incredible….these are gutsy gals. The chlidren are very quick learners and they’re very competitive. If one can swim out a bit further, they all will. 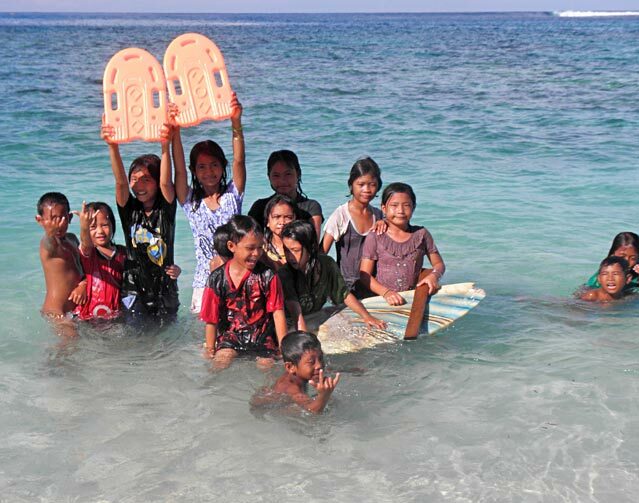 After 5 weeks of classes most of the group are now confident to swim out to me in deeper water, having a breather when they reach me before swimming back to their friends waiting and cheering for them on the beach. They are beginning to grasp how to breathe properly when swimming freestyle and their backstroke is coming along just great. It’s exhilirating and a privilege to teach children who literally jump at an opportunity to learn something. Ayo Ayo KSC!